Floaters and spots occur when the vitreous, a gel-like substance that fills about 80% of the eye and helps it maintain a round shape, slowly shrinks. As the vitreous shrinks, it becomes somewhat stringy, and the strands cast tiny shadows on the retina. Eye floaters are spots in your vision that drift about when you move your eyes and appear to dart away when you attempt to look at them directly. They can be extremely annoying, but floaters and spots are usually not a cause for concern and rarely reach a stage in where they affect normal vision function. Occasionally they can indicate a retinal tear, a retinal detachment, or an inflammation inside the eye. Inflammation in the back of the eye. Eye surgeries and eye medications. Most eye floaters can be frustrating and adjusting to them takes time but don’t require treatment. Underlying causes, such as bleeding from diabetes or inflammation, require treatment such as macular laser surgery or corticosteroids. Surgery to remove the vitreous. This invasive surgical procedure is called a vitrectomy. In this procedure, some or all of the vitreous is removed from the eye, along with the eye floaters within it, and is replaced with a sterile clear fluid. Using a laser to disrupt the floaters. 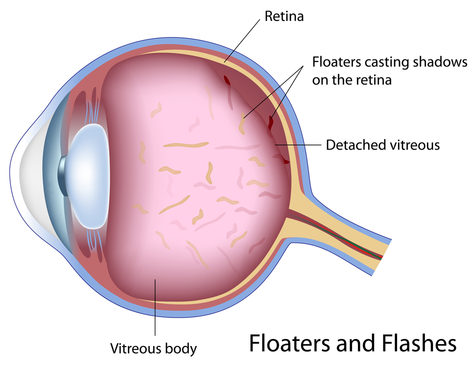 A surgeon aims a special laser at the floaters in the vitreous, which may break them up and make them less noticeable. Floaters and Spots: “It’s not what you look at that matters, It’s what you see.” Your vision is everything, so take H.D. Thoreau’s advice and get your eyes checked so you can see the beauty in the world around you. Call Alpharetta Eye Clinic or Windward Eye Care for a comprehensive exam. We think our patients are SPEC-TACULAR.